The cradle of Alpine skiing and the capital of skiing in Austria – two undoubtedly titles, that have given St. Anton am Arlberg unparalleled reputation among other resorts in the Alps. St. Anton offers you to enjoy the very same slopes on which the legendary Hannes Schneider developed the skiing technique known as the stem turn, the very foundation of modern Alpine skiing. Unlimited opportunities on and off the pistes for all the family makes St. Anton am Arlberg an ideal ski holiday location. Located at an elevation of 1304 m, in the Tyrolean Alps, St. Anton am Arlberg is one of the villages comprising the world famous Arlberg ski resort area. Despite its rapid development and popularity, St. Anton has remained a charming, rural and truly Tyrolean village at heart. 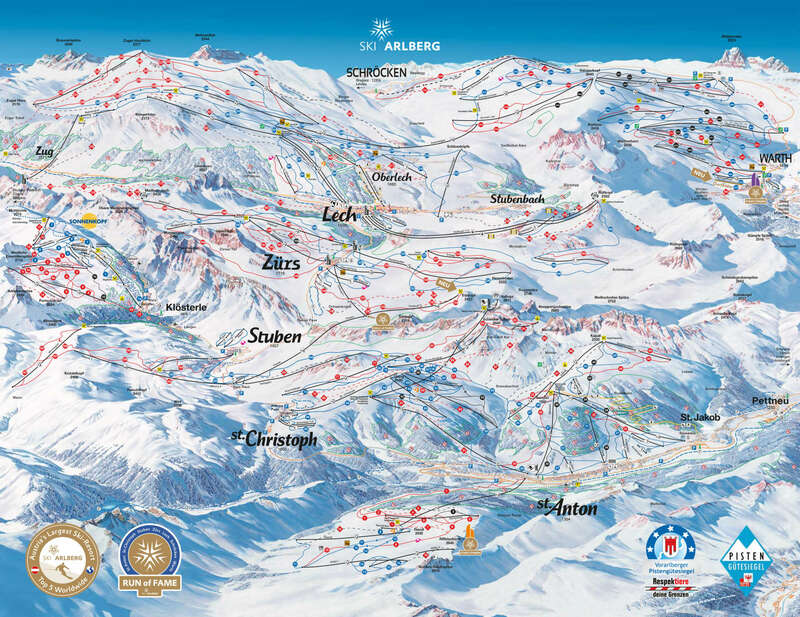 St. Anton am Arlberg is easily reachable by national and international rail services with a station in the village. Transfers are then available to take you on to your final destination at St. Anton am Arlberg. Regardless of your plan of travel when heading out to St. Anton am Arlberg, our dynamic pricing system will keep your travel expenses as low as possible. By considering the specifics each individual journey, we can offer our costumers the best possible deals at all times. Choosing Alps2Alps means securing comfortable and dependable transfers for you and your group to your chosen destination for the lowest possible price. All of the aforementioned price-forming factors will only ever result in our ski transfer base-rate. We never over-inflate our quotes at any time or for any reason. We also offer sizable discounts for off-peak, off-season and midweek transfers to St. Anton am Arlberg. If seeking for the best possible deals, travelling outside high season or midweek typically results in the biggest savings. We offer midweek (Monday to Friday) prices with discounts up to 60%! Your transfer quote will also be influenced by overall vehicle availability, your transfer schedule and vehicle utilization during the transfer, as well as other possible costs like road tolls and airport parking fees. In case you have any special requirements or plan to be travelling as a larger group, please contact us directly so we can discuss this. St. Anton am Arlberg offers a wide variety of entertainment opportunities for families with children. Professional ski instructors help to encourage the beginners as well improve the skills of the more experienced skiers. A ski kindergarten gives parents a chance to have some time for themselves on the pistes while their children have fun playing games. Hiring a private instructor is a great idea for families wanting to improve their skiing skills together. If you’re searching for value-priced transfers to and from St. Anton am Arlberg look no further. Moreover, booking in advance means securing the best possible deal for each and every transfer. Unable to locate the service you're looking for on our website? Get in touch with our customer service team and we will find a solution suitable all your needs. Transportation during the holidays shouldn’t be a burden. Choose Alps2Alps for your ski resort transfers and start enjoying the breathtaking Alps stress-free the moment you step on board!